Jimmy writes to ask: I’ve taken the plunge into raw, selvedge denim (which I really like) and I’m thinking about trying unsanforized jeans. Are there any pros and cons to going unsanforized? As many readers know, raw and unsanforized don’t mean the same thing. Raw refers to denim that hasn’t been pre-washed or -distressed; unsanforized means the denim haven’t been pre-shrunk. There are plenty of raw jeans that sanforized/ pre-shrunk at the factory. In fact, most are – you kind of have to search if you want a pair or jeans that are both raw and unsanforized. The reason why people buy raw is so they can get jeans that develop beautiful, natural fades over time (which always look better than factory-produced fades, and will feel more personalized to you). But why would you want something that’s not pre-shrunk? To Get the End-to-End Experience. 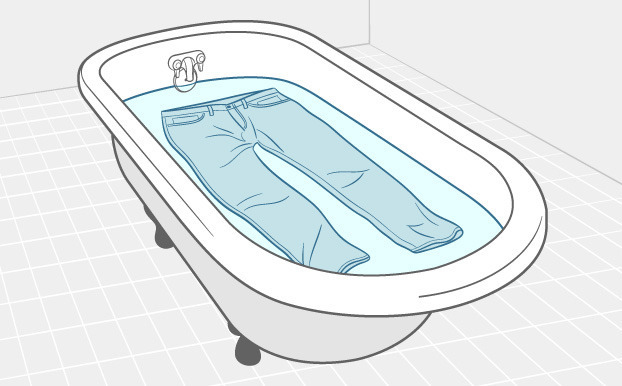 When you buy a pair of unsanforized jeans, you have to soak them in a tub to get the shrinkage out. 3sixteen has a nice guide on how to do so here. For many denim nerds, being able to do that extra step is a way to further personalize their jeans. To Preserve the Character in Denim. Sanforization involves a lot of heat, moisture, and pressure, which means the denim tends to come out a bit flatter and more uniform. If you want to preserve the character of denim as it comes off the loom – which in turn will affect how your jeans look once they’re faded – you’ll want to go unsanforized. Generally speaking, unsanforized denim will always have more character. To Customize the Fit. As that 3sixteen guide shows, shrinking your jeans at home can be a step-wise process. Give them a thirty minute soak, and then see how they fit once dried. If you need to shrink them down further, soak them again (maybe even in hotter water). Want to just slim the legs from the knees down? Just re-soak those parts. Need to slim the waist? Just re-soak the waistband. To Get a Certain Look. Unsanforized denim molds better to your body over time, particularly in slimmer fits. Why shouldn’t you buy unsanforized denim? For all the same reasons above. 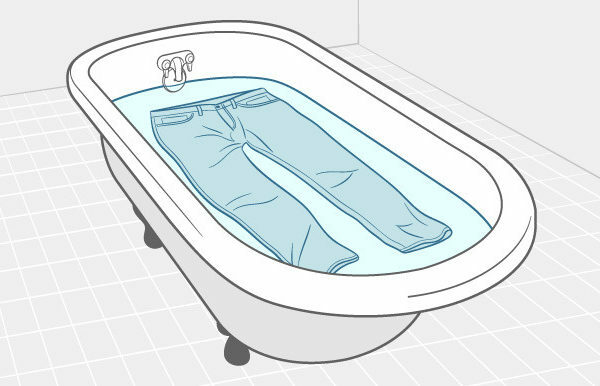 Maybe you don’t like the idea of needing to soak your jeans at home, or you dislike the uncertainty that comes with sizing. Certainly, if you buy unsanforized jeans, get them from a company that’s very familiar with the product, as they’ll need to tell you what to expect in terms of shrinkage. Under $125: Levi’s 501 Shrink-to-Fits, Luther’s, and our advertiser Gustin are the most affordable options. Note that most of Gustin’s jeans are sanforized, but once in a blue moon, they’ll have an unsanforized offering. Just keep an eye out. Under $250: One of my favorite denim companies, 3sixteen, produces unsanforized versions of their popular SL-100 and ST-100 jeans. The denim is beautifully textured, which gives them a nice, slubby look once faded (they’re sold out at the moment, but plan to restock early next year – look for the Kibata line). Additionally, check out Naked & Famous, Red Cloud, and Levi’s Vintage Clothing. Above $250: Lots of options at specialty shops, such as Self Edge, Blue in Green, Standard & Strange, Blue Owl, Rivet & Hide, and Tate & Yoko. I particularly like the stuff by Flat Head and Stevenson. Flat Head’s jeans develop really high-contrast fades, while Stevenson incorporates a lot of nice detailing (e.g. single needle stitching, handsewn belt loops, leather backed buttons, etc). Do a search for unsanforized at each shop and see what pops up. Most people are better off with sanforized denim. It’s clear cut, simple, and you know exactly what you’re getting. If you want to try that end-to-end experience, however, and think you might like the unprocessed feel of unsanforized denim, give it a try. It’s not nearly as scary as it sounds, and if you buy from a store with knowledgeable sales associates, they’ll be able to talk you through the process.